Today, at COP21, IFAD interviewed another farmer from the World Farmers Organisation (WFO). 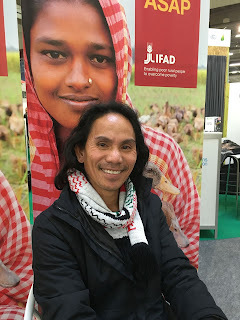 His name is Jonjon B. Sarmiento, and he is a sustainable agriculture practitioner from the Philippines. Jonjon: Climate change is affecting us more and more every day. We are struggling because of the weather’s unpredictability. We are experiencing floods, droughts, and just recently we were hit by the strongest typhoon that, in less than four hours, wiped out all our livelihood and permanent structures. We also have a problem with the salinity level of the water, long dry spells and lack of rain that brings the decline of crops. Jonjon: I would like to see agriculture in the agreement. Agriculture is one of the major solutions to climate change, and still it is being neglected. Instead of introducing chemical farming, which is changing the landscape of farming in the Philippines and depriving us of our agricultural biodiversity, I would like to see an agricultural transition from chemical farming to agro ecology. This is what us smallholder farmers need and this is what I expect from COP21. It’s good that food security and ecosystem were included in the preamble of the text. However, the agreement needs to be translated into real action to provide a better future to the generations to come. Jonjon: IFAD should continue to reach smallholder farmers with its projects. We are the ones on the front line of climate change, and we need the right information and tools that can help us face this serious threat. Climate change is a major global challenge and in order to fight it, more power needs to be given to the farmer sector. In particular, I believe that IFAD should invest more in agro ecology as in the Philippines we use this as a tool for rehabilitation from the impacts of climate change.